@stephonee I know you use networthiq from your posts…I'm having trouble getting it to load for me. Are you having similar issues? And it was at that point that I knew I was probably in trouble. Sometime, years ago, I started making backups of my NetWorthIQ data, because the site was buggy af and I knew this day would come. But, I was lax in keeping up with those backups. After all, I technically have all the data from 2008 onward in a spreadsheet, anyway. I could always just recreate the numbers from scratch and do a whole new graph! Except that sounded like a lot of work, so I never got around to doing it while NetWorthIQ was still alive (when it would have been notably easier). And now, finally, during one of the busiest months of my entire life… it died. Because of course. But in the end, I found or calculated all 140 monthly net worth updates (including this month’s!) going back to the very first one at the end of 2006, and now I can make pretty graphs. 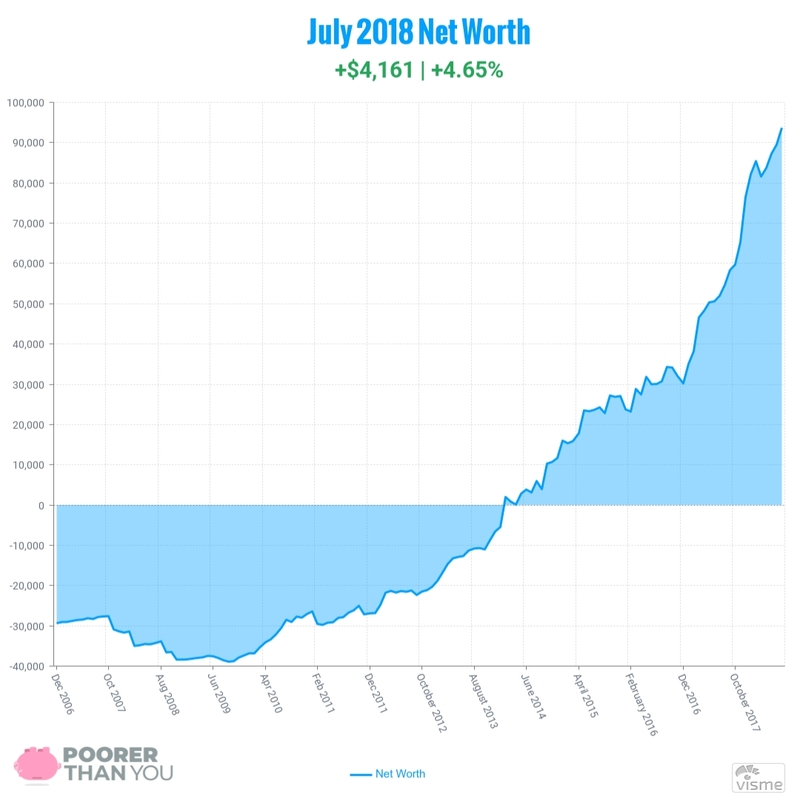 And so, without any further complaining about all the work I made for myself ado… here is my brand-spanking-new, much-beautified net worth graph! Ahhhhh yes, that’s so much better, isn’t it? I cleaned out some of the garbage (there’s no way I was ever going to use the “Other Mortgage(s)” category), and customized this whole thing to my heart’s content. But enough about the graph and chart… let’s discuss that $4,161 increase!!! What what?!? For such a good month, not a great month for cash! This is the result of (surprise surprise) a clerical error on my part. You see, I somehow ended up with 3 separate HSA accounts at some point. Each one with 2 sub accounts (a cash account and an investment account). So I was counting the cash accounts of each one as, well, Cash and the investment accounts as Retirement. Except that just like I’m a big loser who failed to back up her NetWorthIQ updates for the past 6 years, I actually failed to count the newest HSA’s investment account as Retirement. I didn’t forget about it entirely, I just had it under Cash for some dumb reason. So I fixed that this month, and well, now it looks like Cash took a big hit and Retirement went gangbusters. And, on top of that, the last few months where I said that the gains in my Retirement accounts were due to me contributing to my HSA? No, silly Stephonee… those were actual investment gains because those contributions weren’t being counted as Retirement. Whoops! But again, now they are! So while there was an on-paper loss, it was actually a really good month for cash. Work got crazy busy and I pulled a ton of overtime (and my husband, who works with me, lent a hand and managed to get overtime too, which is bananas when you remember that we work opposite schedules from one another and have no child care). Only one paycheck with overtime hit in July, but it was a nice bump. August should be even better, because it’s a 3-paycheck month for us, and that first paycheck was full of July’s overtimey goodness. Of course, I say the above as I’m currently at home sick (whole family picked up some sort of bug) not earning any more overtime, so maybe August won’t be so hot in the end. Curses upon this illness! We did get a little spendy in July too, though. I was totally not at all interested in Amazon’s Prime Day theatrics this year (or as I’ve renamed it, Instant Pot Day, which is a part of why I didn’t care because I’ve already got an Instant Pot from last year’s Prime Day, thank you). But once Amazon got their act together and stopped just giving us doggy error messages, my coworker pointed out a deal on Calphalon pans. And well, I had been not bothering to get a new skillet for literal years after our old Ikea one warped and cracked, and had to be thrown out. Except now I see that they are offering that pan set for the same price I paid on Prime Day and I totally feel like a sucker. But a sucker who finally replaced her broken skillet, at least. And who now owns a saucier pan as well, which makes me fancy. Along the same lines, I bought some $160 sheets this month. Mostly because they have a lifetime warranty, so just like the Calphalon pans, I’m hoping this is a “buy it for life” purchase. Except I personally think the claims that these are the “softest sheets ever” are totally overblown and that’s why I’m not linking to the sheets I bought. But if you listen to podcasts, you probably know the ones I’m talking about, because they love to sponsor podcasts with their ads (and yup, that’s totally how I ended up buying them). So yes, pricey pans, pricey sheets, and a reasonably-priced smart phone on a discount plan… it was a bit of a spendy month. But other than rolling my eyes at the “softest sheets ever” and literally having not even washed the Calphalon pans yet—you know what? Let’s… let’s just move on. If you missed my explanation above, this is mostly the result of my “whoopsie!” And a bit of account growth, too. I think the most annoying part of this is how friggin close I was to $100,000 in retirement this month without actually getting there! $141 away, are you kidding me right now? Obviously, I’ll probably hit the “$100k in Retirement” (and then some) milestone in August, unless the markets go whackadoodle. Which wouldn’t be the worst thing for me, since I’m in the “buying” phase, but ya know. It would be nice to hit it anyway. 3 paychecks in August (and thus 3 contributions to my HSA) should help that along nicely. Oh, Kelly Blue Book value. Sometimes, you’re my friend, and sometimes… you seem to remember that my car is a Toyota Camry with a dent in it. That’s fine. At least it’s fully paid for, hey-o! My LendingClub account appears to be gasping for air! Some loan that was behind on the payments probably paid up rather than going to collections. Still, I’m not impressed—there have been waaaay too many defaults on my loan notes over the years. I’m still pulling my money out of the account (slowly and lazily). Still just chugging along with the minimum+3 cents (because rounding!) on this one. Things won’t get exciting here for another 10 months probably, so we’ll just stay patient. A reminder that this is a 0% balance transfer from my student loan, and not a “real” credit card debt. I’ve almost got enough in cash savings to pay this off in full (should have 100% of it set aside in August! ), I’m just letting it ride out the 0% promo rate. You may notice that I haven’t fixed the minimum payment that I complained about last month… July was just not the month to be tweaking things. With all the overtime and craziness, it was more of a “survival mode” month. But I’ll eek out a few more pennies in interest later! I finally paid off that $152 loanshark loan! Just kidding. This is boring tax stuff from my bidness. The Milestone: $100,000 net worth. Only 5 months left to get there on time! But with this month blowing up like gangbusters, I just need $1262.40 in net worth growth each month to get there by the end of the year. So, a quarter of what I pulled off this month, basically. Yup, that seems doable. Other Milestone: $100,000 in retirement accounts. Uggggggggggggggggggh, the frustrating thing about the “gifs only when we hit the milestone” rule is that I can’t use a Get Smart “missed it by THAT much” gif right here. Just $141 short! Ah, well. In all likelihood, NEXT MONTH THERE WILL BE GIFS!! BONUS: Zero2FIRE hit $100,000 Net Worth! Gotta give a shoutout to my girl Zero, who was also working on a $100,000 net worth goal… and just got there! Well… Heckin'! Guess who finally reached the ?$100k Net Worth? goal?? ? Was hoping to reach by June 2019 when I first started out in January of this year, so it's a full 10 months early… ? Oh in my excitement yesterday, I completely forgot to give myself my first ? for my #NetWorthStarJar!!! $100k down, many more left to go!!! How about you, friend? Are you celebrating a net worth milestone that I should be jealous of? Share it in the comments below and maybe I’ll feature it next month (with the requisite dishonor upon you if you’re beating me)! And if you’re not tracking your net worth, do eet! Do eet now! You can use a simple spreadsheet and an outdated tool that you forget to make backups of like me, or you could be smart and let Personal Capital do the tracking for you (but you should probably make backups), and get a $20 Amazon gift card in the process! I don’t know of any other task where I’m willing to spend the hours to recreate the data but this one 😀 I’ve been recategorizing accounts for the last three months, that had better be the last of them. Yay for the upward trajectory! I think we’re a whole lot away from our next milestone so nothing big to celebrate here, but our milestones are also further apart now that the numbers have reached a larger scale. TRUE FACTS. I’ve lost data before, but never gone this far to recover it. Of course, I also underestimated how hard it would be to recover the data! Better backups are called for in the future, fo’ sure. I had entries going all the way back to 2003. It’s really sad to think it could be gone, it was my financial diary of sorts. Given the fact the site wouldn’t allow new entries for what seemed like the first month of each year I guess it was just a matter of time. 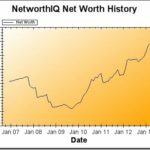 networthshare.com was off to a good start copying it, but it’s very glitchy. I don’t understand how sites like these, which take next to no money for upkeep, go by the wayside. Ahhhhh you are SO close!!! I’m frustratingly close to a net worth milestone right now and it’s like cmon really?! We currently use an excel spreadsheet to track our net worth, but I really like the graphics that you have created and how you track the percentage difference. You are so close to your milestone goal, Good luck!!! So close to that $100k mark! That is awesome. Keep rocking it and we love seeing your progress. Congratulations Stephanie! Great informative article! Your net worth update is really impressive & inspirational. What do you use to generate the beautiful new graph and table? What, reveal my secret so that all the other bloggers can have beautiful graphs, too? Bah! Just kidding. 😉 See the watermark in the lower righthand corner that says “Visme” – that’s the name of the web app I use to make the new graphs from the spreadsheet data. Just trying to keep track of my networth with charts (now that NetworthIQ is dead). Did you have to pay Visme to use the charts or is it free? I am just using the free version of Visme – it lets you make up to 3 different “projects” and I only need 1 (the net worth chart). 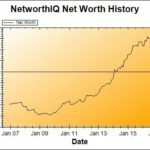 Though, if you are just looking for a tool to create a net worth chart, I would suggest checking out networthshare.com. I didn’t like them for my purpose (making a chart for a blog) but it was built as a NetWorthIQ alternative and depending on your tastes and how you’ll use the chart, you may like it! Oh, and the table! That’s just made in Open Office Calc (a free alternative to Microsoft Excel that I use for my spreadsheets).